Gallup's research shows a clear link between employee engagement and well-being, with managers serving as a conduit between the two. These days, doctors aren't the only ones interested in well-being. Banks, pharmacies, grocers, and other businesses are introducing programs designed to enhance their customers' wellness. But of all the places you go each day, your workplace may have the greatest influence on your well-being. And the person who can best help you achieve results is someone you probably least expect: your manager. Many employers have hopped aboard the wellness bandwagon in recent years, recognizing that they can play an influential role in helping employees curtail unhealthy behaviors that can lead to costly chronic conditions. A recent RAND Corporation study found that more than 85% of U.S. companies employing 1,000 people or more offer some sort of workplace wellness program. It's safe to assume that these companies genuinely want to help their employees lead healthier lives while seeing a healthier bottom line too. Not only do employers spend a fortune subsidizing employees' healthcare costs, but they also see greater productivity and fewer missed workdays from employees with higher well-being. Yet simply offering a wellness program -- no matter how well-intentioned -- provides no guarantee of improving employees' well-being. Workers must be aware the program exists and be persuaded to use it -- and that's where things get tricky. Though more than 85% of large employers offer a wellness program, Gallup research shows that only 60% of U.S. employees are aware that their company offers a wellness program -- and only 40% of those who are aware of the program say they actually participate in it. 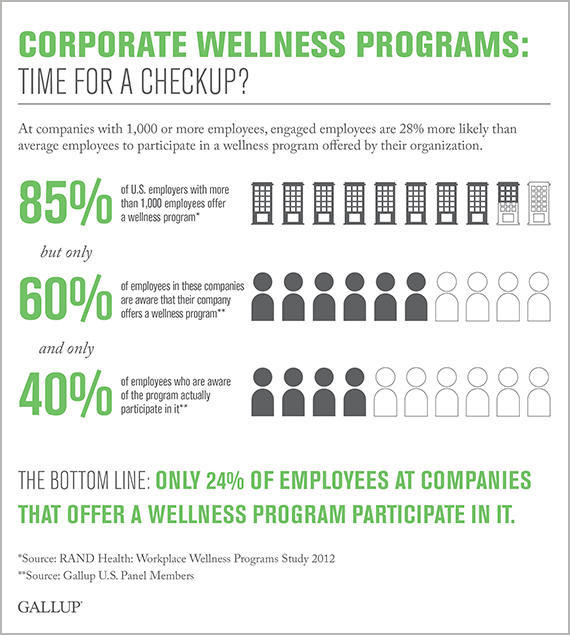 The upshot is that at companies that offer wellness programs, only 24% of employees are participating. For companies that provide these programs, it might be time for a checkup. Clearly, companies must do more work to close the awareness and participation gaps that plague workplace wellness programs, and this is where managers play a vital role. Managers are uniquely positioned to ensure that each of their employees knows about the company's wellness program, to encourage team members to take part, and to create accountability for results. Gallup's research shows a clear link between employee engagement and well-being, with managers serving as a conduit between the two. Managers account for at least 70% of team variation on employee engagement. And engaging employees is vital to getting them involved in company-sponsored initiatives, because engaged workers are 28% more likely to participate in a wellness program offered by their company than are average employees. And research findings suggest a contagion effect; direct reports of managers with high overall well-being are 15% more likely to have high overall well-being six months later. It takes great managers to engage employees. 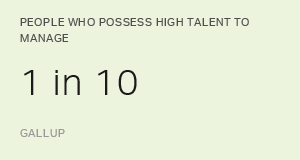 Over the past decade, Gallup has worked with hundreds of organizations to help their managers create engagement and boost employees' well-being. To measure engagement, we ask employees to respond to 12 statements, including whether their supervisor (or someone at work) seems to care about them as a person. This statement in particular reveals whether workers feel that their manager truly cares about their well-being. Those who agree with it are more likely to be top performers and to produce higher quality work, and they are less likely to get sick, change jobs, or be injured at work. But before managers can talk to employees one-on-one about their well-being, they must first build trusting relationships with their direct reports so team members feel comfortable discussing sensitive topics and setting health-related goals with them. This can be a challenge. A 2008 Gallup study revealed that, on average, employees find spending time with their boss about two to four times as unpleasant as spending time with friends. Men in particular report high levels of stress and low levels of happiness when spending time with their managers. Too many company wellness programs focus solely on Physical Well-Being. Managers who engage their employees have an edge when it comes to boosting workplace well-being, though. 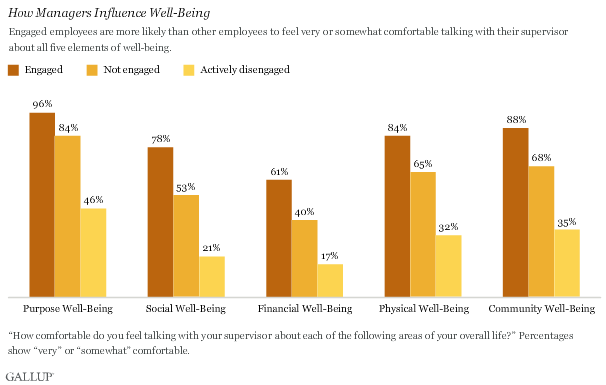 Engaged employees are more than two times as likely as actively disengaged employees to say they are very or somewhat comfortable discussing their well-being with their manager. Though engagement is essential to creating a culture of workplace well-being, it's not enough on its own to create high well-being in all five elements. 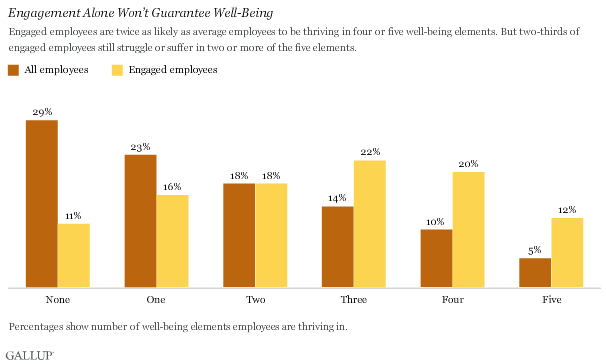 When employees are engaged, they're twice as likely as average employees to have thriving well-being in four or five elements, but two-thirds of engaged employees still struggle or suffer in two or more of the five elements. What's more, the five well-being elements are interdependent and reinforce one another. When employees are thriving in multiple elements, it becomes easier for them to accomplish things that are in their own best interest, such as maintaining good physical health. If you have thriving Social Well-Being, for example, it's more likely that people you care about will be interested in your health. People with more daily stress make worse decisions in the moment. But if you have thriving Financial Well-Being, you will have less daily stress, which makes it more likely you will not fall back on instant gratification that may work against your long-term health interests. Companies are most successful at creating a culture of well-being when they provide managers with the right tools for a holistic, multifaceted approach. Workers are more likely to thrive when their companies and managers address their needs in each of the five elements, rather than simply focusing on Physical Well-Being interventions, such as programs that encourage employees to exercise or quit smoking. Workplace wellness plans aren't cheap. RAND estimates that these programs cost U.S. companies a combined $6 billion a year. But if they're done right, they have the potential to offset rising healthcare costs and build a more productive workforce. To ensure that wellness programs achieve this potential, companies must regularly audit their wellness initiatives to determine whether employees are participating in and benefiting from them. If they aren't, it's vital to find out why. An ineffective program drains financial resources, erodes credibility, and yields no return on investment. Culture: Do my company's programs encompass all five well-being elements? Does our organizational culture support our wellness initiatives? For example, is it socially acceptable in our organization for employees to exercise in the middle of the day or to leave early to participate in a charitable function? Leaders: Do all my company's leaders support the well-being initiative? Do they regularly communicate the value of the program and reinforce how it fits with the organization's purpose and brand identity? Do they consistently model the behaviors that the program seeks to impart? Managers: Are all managers successful at engaging their teams? Do they create the time and focus for employees to participate in the right company-sponsored programs to develop their well-being? Do they help their team members set goals to improve their well-being? As long as healthcare costs continue to skyrocket -- and diabetes, heart disease, and other preventable conditions remain a threat to public health -- wellness programs will continue to proliferate. U.S. companies that promote wellness are on the right track to help workers control their healthcare costs and lead more productive lives, but their wellness programs are probably not as effective as leaders want them to be. Companies can improve the prognosis for better results if they enlist managers to promote well-being initiatives with their teams and in one-on-one conversations with their employees. Expanding wellness programs to track, manage, and enhance employees' well-being in all of the five elements can help companies reduce healthcare costs while improving employee performance and customer engagement.